For Flute and Basso Continuo (Piano/Harpsichord), with Violoncello (Viola da gamba) ad lib. Wq. 133. 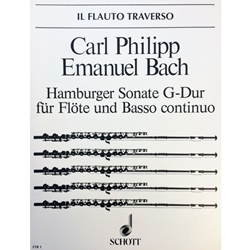 Composed by Carl Philipp Emanuel Bach. Arranged by Kurt Walther. Published by Schott. Note: The special sale price shown is for in-stock quantities only. Get your copy now at this great discount!